Any study of the early weeks of WW2 in the Pacific is certain to notice the campaign for Wake Island, referred to in those dark days as “the Alamo of the Pacific.” Though the “Send more Japs” radio line was never actually sent by those on the island (it turned out to be a radio code deception), the spirit of their defense heartened a nation shocked over their losses at Pearl Harbor and bracing for invasion. When the word came out about the defenders sinking two destroyers and inflicting hundreds of casualties, it gave a nation that had psychologically abandoned the island inspiration and seemed to teach the Japanese that the Americans were not as ‘soft’ as they anticipated. But the island did fall. As a contrast, few studies of WW2 in the Pacific will even mention the Battle of Peleliu, an island of marginal value, which might not have been attacked at all, except those in charge expected it to be so easy. Major General William Rupertus, USMC - commander of 1st Marine Division - predicted the island would be secured within four days. The five battleships bombarding the beaches complained that they had “run out of targets” after a few hours. Both were very wrong. 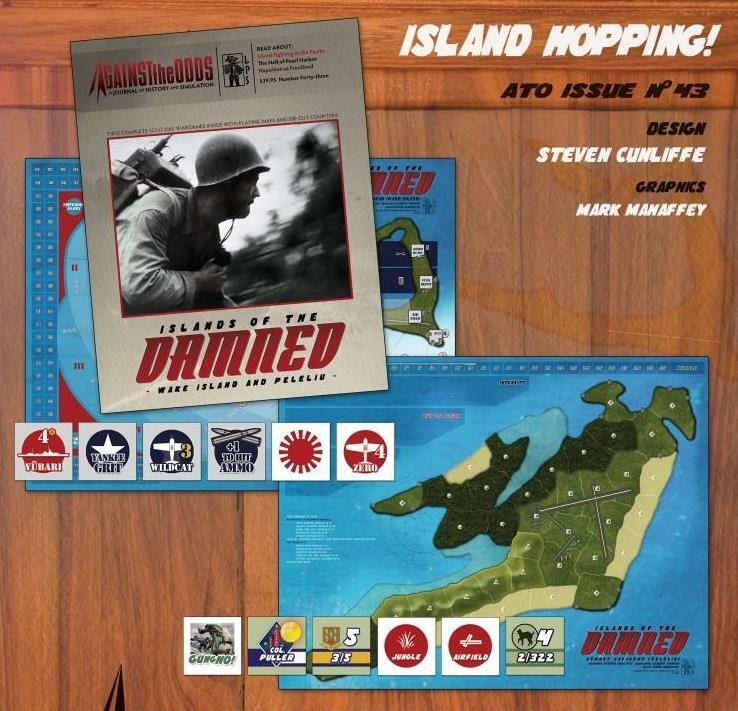 Inside Against the Odds Magazine issue #43 are two separate solitaire games in a package called Islands of the Damned. The first game, Given Up for Dead covers Wake Island and the second, Utmost Savagery takes on the less-known invasion of Peleliu. Designer Steven Cunliffe tackles both battles with innovative systems that challenges players to mix boldness with good tactics. They must gain objectives but minimize casualties...as the historical commanders would have liked to do. The Islands of the Damned comes with 176 large, full-color 5/8" die cut counters and two separate 17”x 22” full color mapsheets that contain displays and tables needed for each game. You will be commanding the American forces in each game, challenged with doing far better than the historical outcomes. Can you save most of your troops from the Islands of the Damned? Download the rules for Islands of the Damned (in PDF format).